A titch, a scoatch, a smidge, a squizzle. We all pitch in. Working hand-in-hand as volunteers on the Blackfeet Reservation. We started our week on the Memorial Day holiday – so many of the “standard” Global Volunteers project sites are closed for the day. But, there’s plenty of work to do nonetheless. Most of our team started at Chuck’s ranch and helped to put up a fence in an area where a microburst had taken down an old barn. Jim & Linda worked from the church we were staying at to coordinate their healthcare training service for the duration of the week. Partway through the morning Amanda and Halfdan departed to assist Tom with fencing work on his land. Fence-building 101: A crash course on the Reservation! On Chuck’s ranch, we worked together to dig fence poles and hang fence boards. This was our first day as a team and first day’s show how teams will work together for the duration of the week. Everyone jumped in immediately. Throughout the morning, the small work groups shifted and flowed as different people were available at different times. Each of our team members serving on the ranch got to work with each of the other team members. In the early afternoon, we broke for lunch and some time to pet Champ, Scooter, and fluffy little Tug (the herding dogs on Chuck’s ranch). We had an opportunity to chat with Chuck, who is a very kind and caring person. We learned that his family opens their ranch to people from around the globe throughout the summer. As work continued after lunch, the group continued to bond over non-standard measurements, and we were able to complete the section of fence on the ranch. Volunteers were taught how to repair barbed wire fencing – a routine task on Reservation ranches. Over at Tom’s, Amanda and Halfdan got the opportunity to learn about the Sun Dance before helping to tighten barbed-wire fences on his property. Late in the afternoon, we regrouped to visit a local Indian art gallery, where several team members discovered beautiful works to admire and purchase. It was a full day, but it was not nearly over as we hastily ate dinner and the majority of the group accepted a generous offer to join local people in a traditional sweat. We were honored to be allowed to participate in this event that is not open to tourists. The fact that the sweat was opened to us is a true testament to the value Global Volunteers has brought to this community, and that they consider Global Volunteers to be a part of the community. The sweat was strongly significant to several members of our team and we are so thankful to have been allowed to participate. On our first day, we really showed our flexibility. It was a great day for us all to serve several local people, experience so much more of the local culture, and get to know our fellow team members. This morning we divided into work groups with Kent, Alexis and Maggie going to Eagle Shield Assisted Living to help prepare and serve meals for seniors, Pat and Mary Kay to the high school, Amadan, Halfdan and Sarah went to Tom Crawford’s to continue work on fences, and Pat to work with elders at the Blackfeet Care Center. Pat & Mary Kay ham it up in their hair nets with kitchen staff at Eagle Shield Assisted Living Center. The Eagle Shield group rated their day as super. Alexis’ experience of helping to deliver meals to homes was a truly cultural experience—abject poverty greeted her, and really opened her eyes. The other two learned to make fry bread for Indian tacos, which were served to residents and others who eat their main meal (lunch) at Eagle Shield. I had a nice day at the local nursing home chatting with three residents. They all had amazing stories to tell about life on the reservation. Time went fast in the morning. But, the “in house yard sale” in the afternoon was slow! Meanwhile, Linda and Jim gave classes on CPR and EMT which were very well-attended. Jim demonstrating infant CPR on a mannequin for reservation EMT students and professionals. Upon waking after nine hours of sleep, the first thing I think is: “Wow, I’m tired!” Working outside every day is tougher than it seems. My team at Pastor Hill’s ranch had a great time yesterday though, and I really enjoyed learning a bit more about the ranch life. One thing I clearly remember him saying was: “There are plenty of possibilities and resources, we just have to create them and use them.” The other teams at Eagle Shield and the Care Center seemed like they had a great day as well, again, and with less sunburns than Halfdan and I! The week continued with a predictable schedule. Waking up, reviewing our work assignments, eating breakfast, loading up in the van, driving to our work sites. Maggie, V Pat, X Pat and Mary Kay worked all week at Eagle Shield, Jim and Linda continued CPR teaching, and Amanda, Halfdan, Sarah, Alexas and Kent assisting with various labor projects around town. At Paster Hill’s place, we put some rabbit cages in the back of his truck, and that he delivered to one of his church members. Peter took us to the high school to help distribute books in some of the classrooms to prepare for the new school year. We continued to help out when we got called, and along the way, were able to work hand-in-hand with many wonderful people. Bob Tailfeathers came to show us his artwork, beadwork and his dance regalia. We visited the Museum of the Plains Indians, the Trading Post and all the souvenir shops in town. We held an Indian taco dinner which Bob Tailfeathers attended, and Elaine’s husband came too. It was messy but good! We got to hear a few of Bob’s “true stories.” Kent, Halfdan and Amanda went to Tom’s sweat lodge to do a quick sweat. Tipis on Blackfeet member Tom Crawford’s ranch. We’re grateful for the hospitality, the friendship and the amazing cultural experiences as volunteers on the Blackfeet Reservation of Montana. 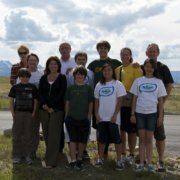 Read More Posts About Global Volunteers on the Blackfeet Reservation Here.